It’s National Dog Day! Woof Woof! Normally I don’t chime in on these national day of “fill in the blank” but I’ve got to jump on National Dog Day since I now have a dog. I didn’t even know there was a National Dog Day until just recently! 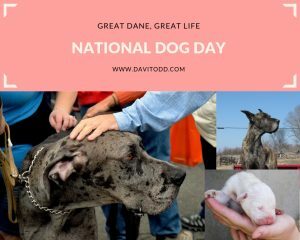 National Dog Day was founded in 2004 by dog lover Colleen Paige. The day is celebrated every August 26th. I like that it is a set date and we don’t have to count out to the fourth Sunday of the month of something like that. Our dog is a Great Dane. He was born with the Blue Merle gene and therefore was not show quality. Of course, that hasn’t stopped him from being a family quality dog! Great Danes are commonly called “gentle giants” and they really are very sweet dogs. Our dog can’t stand for someone to be upset. He must come over and try to love them back to happy. Not all of my friends appreciate his effort! There is a lot of slobber involved with his affection for sure! Living with a Great Dane is similar to living with a rock star. Everyone wants to talk to you about the “horse” you keep inside your home. Those who are shy may not enjoy the new found popularity that comes with owning a giant breed dog. Since people often ask me, “Would a Great Dane be a good fit for my family?” I’m going to start with the “bad” of living with a Great Dane. Thankfully there are very few of these cons. In real life, a rock star is expensive. In Great Dane life, the dog is expensive! Ours is a little fat, weighing in at 175. A dog of this size is going to eat a lot more than his 30 pound cousin, he is the size of an adult man. Medications for a Great Dane are also going to cost you. Due to the large size of the dog, you’ll need much more medication to reach a therapeutic dose. They can also have thyroid issues so some medications may not be a good choice for this dog breed. Their accessories are going to cost more too. You’ve got to buy or make a much larger bed for your dog. In the past I would by 6 pillows from the dollar store and then get a king size sheet and sew it into a pillow case. I’d sew the pillows together and then tack the sheet case to the newly made bed. After many shredded dog beds, I finally threw in the towel and got him his own sofa. Toys need to be made of high quality materials if you expect them to last more than a week. Our darling dog loves to carry around a stuffed animal before bed. Unfortunately, they don’t last long so we have to keep a nice supply stashed away. There is a lot of slobber. Perhaps the Great Dane breed will not slobber as much as an English Mastiff, but there is definitely a lot to go around still. Our dog will shake his head after every drink and he can fling slobber all the way to ceiling. There are times he literally wipes his nose on the wall or sofa. This means we have to schedule plenty of “wall washing days” among other things. Remember above when I mentioned people ask me about the “horse” I keep? Well, if he is the size of a horse, you can imagine that his potty trips are the same size as well. We have literally broken a cheap pooper scooper with this dogs load! 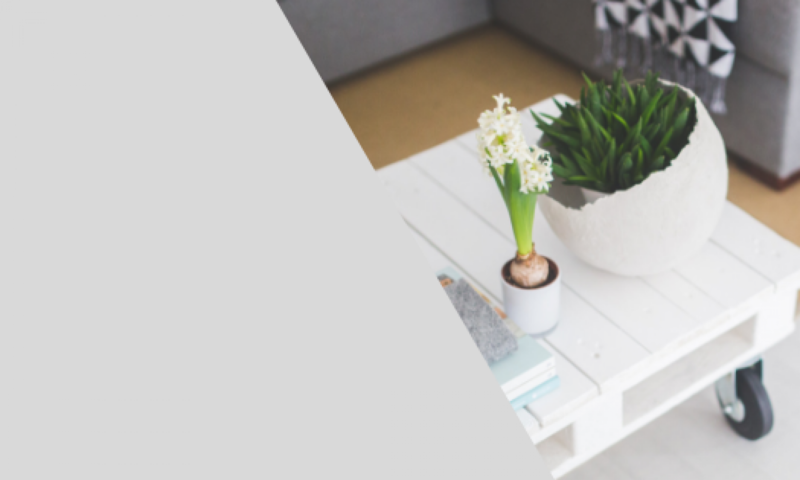 If you’re living in a place that has a limited yard, you may want to consider the waste the dog will need to eliminate. He has also killed a plant or too with his heavy dose of “watering” as well. Lastly, they are VERY close to their pack. Our dog doesn’t do well at all if he has to sleep alone at night. He needs to be with his people or he will get sick. We made the mistake once of having a neighbor check on him while we were gone for about 17 hours. Since we got in so late, he was worried and got a nervous stomach and made a mess. Our friend did the best she could to clean it up. It was a very good thing carpet shampooers were available! As long as he knows we are in the house, he doesn’t mind sleeping alone on his sofa. From now on, if we leave and can’t take him, we have to find a dog lover to stay with him overnight. This dog is certainly a loyal friend. He loves the whole family and doesn’t choose to be loyal to just the alpha family member. He’s really not a barking dog unless someone comes to visit and then he alerts us to the company. Most of the time he just sits right under my feet sleeping to day along. It’s almost like having a living throw rug! A Great Dane is big enough to go and do long hike trails and enjoy the outdoors with us. If you end up wearing yourself out, he’s more than happy to sleep the day away with you as well! I love that his energy level is pretty low but he can also be motivated to “get up and go” for a little chicken and car ride adventure! In my opinion, the Great Dane is the best dog to own! 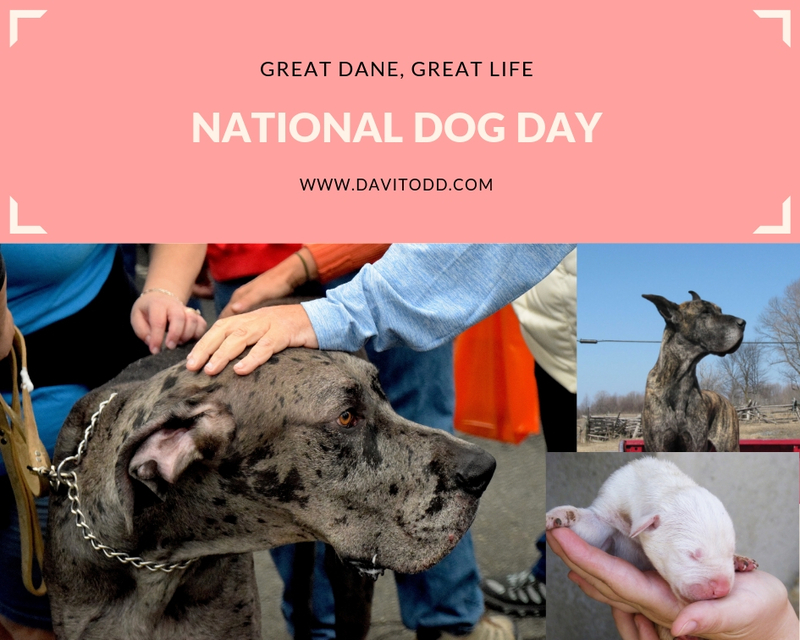 Our Great Dane has brought so much joy to our lives. Here is a video of our Great Dane getting a drink from a water bottle. Such a silly boy. 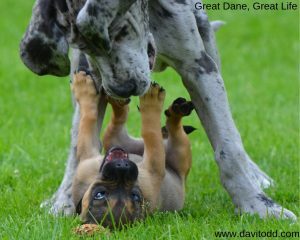 Young Great Danes at play. Below are affiliate links of products we use and love for our dog. These links will take you to sites such as amazon if you’d like to purchase some for your own dog. I do receive a small commission from these companies at no extra charge to you. 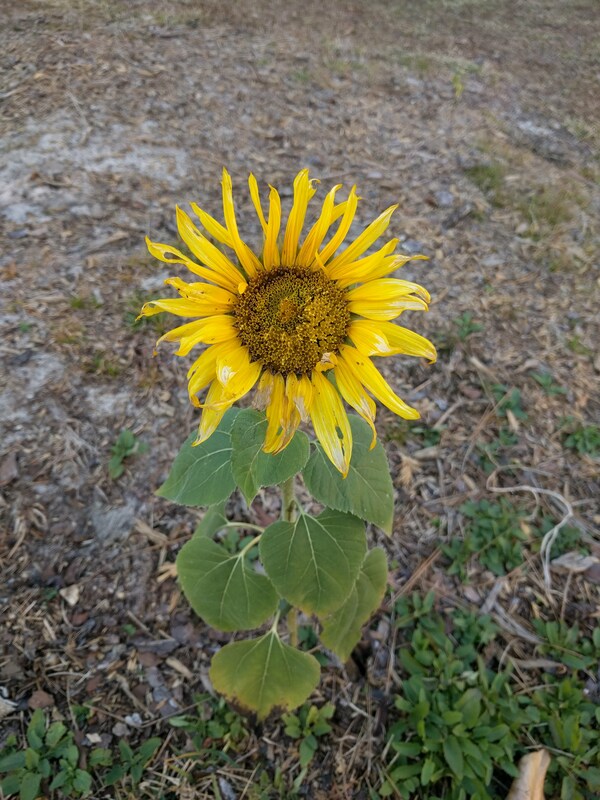 I truly appreciate your support! I’d never violate your trust and recommend products that I don’t use and love myself. This is our favorite Kong chew toy. I often put peanut butter inside and he really enjoys that! This Kong frisbee is very durable. We really enjoy this out at the dog park. We also love this dog tag that slides right on to the dog collar. The tags that hang would break off and the Velcro would eventually wear out. These Bully Stix are another one of our dog’s favorite chews. They also have antlers and pig snouts. If you click through the link I provided, you will get free shipping on orders $79 and over! This Safari nail trimmer has been the only one we have been able to use for more than a year! Right now, it’s only $6.00 on Amazon! Get this while you can. We have broken so many nail trimmers on Great Dane nails! This one is really awesome! I really appreciate you dropping by today and reading about our dog. Would you like to hear more about our Great Dane life? Let me know what you think of living with such a large animal in the comments below.